The 2015 Garmin 2599 LMT-D is a new middle of the range Garmin GPS unit that has been design to offer the user all the directions they will need, but not the massive price tag that the top of the range GPS units come with. The Nuvi 2599LMT-D may sit in the middle of Garmin’s range of 34 GPS units but it still offers a number of fantastic features all that have been designed to help you get to your destination on time. Features include, Bluetooth, voice recognition, traffic alerts and free lifetime map updates. The 2599LMT-D comes with a 5.0 Inch, pinch-to-zoom, touchscreen that offers the viewer a fantastic very clear picture to view Garmin’s all new 2015 updated maps on. The screen works well either in day or night and unlike many old mid range gps units, it also works well in direct sunlight meaning that users do not have to use a gps shade. As an added benefit with the 5-inch GPS device comes as standard with Garmin’s switch screen that allows the user to view the screen either horizontally or vertically, whilst the all-new 2015 processor means that route calculations are now faster than ever. 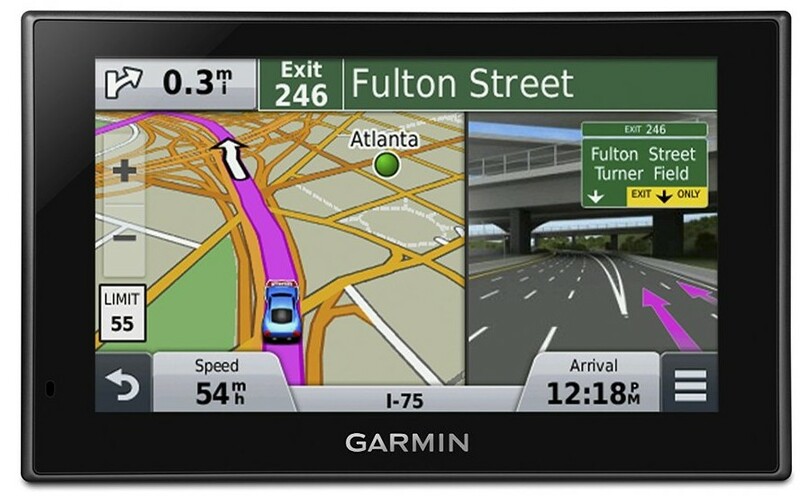 Like many of the top gps designs for your car, the 2599LMT-D comes with Garmins all new traffic alerts which update every couple of minutes and provide traffic support on any traffic jams that are along your route and most importantly allow you to choose routes that have the least amount of traffic on all to help you get to your destination on time. Voice Control - Meaning that you can control your gps unit with your voice, however i must say, its not the best voice control on the market. Using the voice control to find a point of interest is difficult, whilst trying to add a ZIP code, impossible. Bluetooth - meaning that you can connect your cell-phone to your gps device and use its in-built speaker for phone calls. One thing we don’t like about this is whilst the voice calls are great, you cannot dial using your voice or the voice control systems and the speaker could be a little louder and therefore allow you to speak into your gps unit with your windows down. Car Park Pin – Entering a car park you can now press a cark park button on your gps unit that allows you to track your car with an app from your phone. Losing your car should therefore now not be possible, however it does no work very well if you have parked in a multi-storey car park. Supports App - Given the Garmin 2599LMT supports Apps, you can now download a range of different apps to help you with your travels. Everything for contact support to Four square’s infinite point of interest resource is included to help you with your travels. Overall, we love the Garmin 2599LMT-D given its fantastic value for money, offers serious features even though its really a middle of the range gps satellite navigation unit it does come with fantastic performance and usability. We hate one thing though, and that’s the voice control aspect which really does not work, however I suppose the social media integration does make up for this.